광학용 부재의 가공에 적절한 부재의 가고정 방법과 그에 바람직한 접착성 조성물을 제공한다. Going the appropriate member in the part of the optical member provides a static method and it preferred adhesive composition. (A) 다관능 (메타)아크릴레이트, (B) 단관능 (메타)아크릴레이트 및 (C) 광중합 개시제를 함유하는 접착성 조성물로서, 상기 접착성 조성물로부터 얻어지는 경화체의 유리 전이온도가 -50℃~40℃인 것을 특징으로 하는 접착성 조성물. (A) a polyfunctional (meth) acrylate, (B) a monofunctional (meth) acrylate and (C) an adhesive composition containing a photo-polymerization initiator, the glass transition temperature of the cured product obtained from the adhesive composition -50 ℃ adhesive composition, characterized in that ~ 40 ℃. 또, 상기 접착성 조성물을 이용해 부재를 접착하고 가고정하여, 상기 가고정된 부재를 가공 후, 상기 가공된 부재를 90℃ 이하의 온수에 침지하여, 상기 접착성 조성물의 경화체를 부재로부터 떼어내는 것을 특징으로 하는 부재의 가고정 방법. In addition, the going and bonding the member with the adhesive composition is appointed, the go after the positive element processing, and immersing the processed member in warm water of at most 90 ℃, detaching the cured resin of the adhesive composition from the member temporary fixation method of the member according to claim. 본 발명은 여러가지 부재를 가공할 때의 가고정 방법이며, 또 그에 바람직한 가고정용 접착성 조성물에 관한 것이고, 보다 상세하게는 광학용 부재를 가공할 때 해당 부재를 가고정하는 방법과 해당 용도에 바람직한 광경화성의 접착성 조성물에 관한 것이다. The present invention is temporarily fixed at the time of processing the various members, and thus preferred to go relates to a household adhesive composition, and more particularly, a preferred optical path to when processing the optical member for how to set to go on the absence, and the use It relates to an adhesive composition of the chemical conversion. 광학 렌즈, 프리즘, 어레이, 실리콘 웨이퍼, 반도체 실장 부품 등의 가고정용 접착제로는 양면 테이프나 핫멜트계 접착제가 사용되고 있고 이들 접착제로 접합 또는 적층한 부재를, 소정의 형상으로 절삭 가공 후, 접착제를 제거하여 가공 부재를 제조하는 것이 행해진다. Go adjustment adhesive such as optical lenses, prisms, arrays, silicon wafers, semiconductor packaging parts, and a double-sided tape or a hot-melt type adhesive used for bonding or laminating a member to, adhesive, cutting and then processed into a predetermined shape, removing the adhesive and it is made to manufacture a processing member. 예를 들면, 반도체 실장 부품에서는 이들 부품을 양면 테이프로 기재에 고정한 후, 원하는 부품으로 절삭 가공을 실시하고 양면 테이프에 자외선을 추가로 조사함으로써 부품으로부터의 박리를 실시한다. For example, semiconductor packaging parts, we performed a peeling from the substrate was fixed to these parts in a double-sided tape, by irradiation carried out the cutting process in a desired part, and an additional UV light to the double-sided tape part. 또, 핫멜트계 접착제의 경우에는 부재를 접합한 후, 가열에 의해 틈새에 접착제를 침투시킨 후, 원하는 부품으로 절삭 가공을 실시하고, 유기용제 중에서 접착제의 박리를 실시한다. In the case of a hot-melt type adhesive is then subjected to after bonding the members, the adhesive penetrates a gap by heating, cutting a desired part, is performed the separation of the adhesive in an organic solvent. 그러나, 양면 테이프의 경우에는 두께 정밀도를 내는 것이 곤란하거나 접착 강도가 약하기 때문에 부품 가공시에 치핑성(chipping property)이 떨어지거나 100℃ 이상의 열을 가하지 않으면 박리할 수 없거나, 자외선 조사에 의해 박리 시키는 경우에는 피착체의 투과성이 부족하면 박리할 수 없는 문제가 있었다. However, in the case of double-sided tape, or due to a weak, it is difficult, or the adhesive strength that the thickness accuracy is chipping resistance (chipping property) falls off at the time of machining parts or can be peeled off without exerting over 100 ℃ column, which separation by ultraviolet irradiation If there was a problem that can not be peeled off if there is insufficient permeability of the adherends. 핫멜트계 접착제의 경우에는 접착시에 100℃ 이상의 열을 가하지 않으면 붙이지 못하고, 사용할 수 있는 부재에 제약이 있었다. In the case of hot-melt type adhesive does not stick include without exerting over 100 ℃ heat at the time of bonding, there was a restriction on the members that can be used. 또, 박리시에 유기용제를 사용할 필요가 있어, 알칼리 용액이나 할로겐계 유기용제의 세정 처리 공정이 번잡한 외에, 작업 환경적으로도 문제가 되고 있었다. In addition, it is necessary to use an organic solvent during the peeling, in addition to the cleaning process of the alkali solution and a halogen type organic solvent, complicated, work environmentally was becoming a problem. 이들 결점을 해결하기 위해서, 수용성 비닐모노머 등의 수용성 화합물을 함유하는 가고정용 광경화형 혹은 가열형 접착제가 제안되어 이들 접착제로는 수중에서의 박리성은 해결되는데 비해, 부품 고정시의 접착 강도가 낮고, 절삭 가공 후의 부재의 치수 정밀도가 부족한 과제가 있었다. In order to overcome these drawbacks, going containing water-soluble compounds such as water-soluble vinyl monomer is proposed the adjustment photocurable or heat adhesive than is solved castle separation in water is in these adhesives, a low adhesive strength at the time of parts fixed, there is a problem that the dimensional accuracy of the members after cutting, insufficient. 또, 특정의 친수성이 높은 (메타)아크릴레이트의 사용에 의해 접착성을 향상시키는 동시에, 팽윤이나 일부 용해에 의해서 박리성을 향상시킨 가고정용 접착제도 제안되고 있지만, 절삭 가공시에는 부품과 블레이드나 다이아몬드 커터 등의 절삭 지그(cutting jig)와의 마찰열을 발생시키기 때문에 대량의 물로 냉각시켜 실시하기 때문에, 상기의 친수성이 높은 조성물에서는 절삭시에 경화물이 팽윤하여 유연하게 되기 때문에, 보다 높은 치수 정밀도에 도달할 수 없다. In addition, but that at the same time, going with improved removability by swelling or partially dissolved and the proposed adjustment adhesive improve adhesion by the use of highly specific of the hydrophilic (meth) acrylate, at the time of cutting part and the blade or because the cooled large amount of water carried, because it generates a frictional heat between the cutting jig (cutting jig) such as a diamond cutter, because of the higher of the hydrophilic composition to be flexible in the cured product swells at the time of cutting, the higher dimensional accuracy It can not be reached. 또, 박리한 부재에 일부 용해한 경화물이 접착제 잔류(adhesive residual)하기 때문에, 외관상 문제가 되고 있다(특허 문헌 1, 2, 3 참조). In addition, since the cured adhesive remaining (residual adhesive) portion was dissolved in a peeling member, there is a problem in appearance (cf. Patent Documents 1, 2, 3). 특허 문헌 1: 일본 특개평 6-116534호 공보. Patent Document 1: Japanese Patent Application Laid-Open No. 6-116534 discloses. 특허 문헌 2: 일본 특개평 11-71553호 공보. Patent Document 2: Japanese Patent Application Laid-Open No. 11-71553 discloses. 특허 문헌 3: 일본 특개 2001-226641호 공보. Patent Document 3: JP-A-2001-226641 discloses. 절삭 가공 후의 부재의 치수 정밀도를 향상시키기 위해서, 소수성이고 고접착 강도이며, 또한 수중(水中)에서의 박리성이 뛰어나고 또, 박리 후 부재에 접착제 잔류가 없는, 환경적으로도 작업성이 뛰어난 광경화형의 가고정용 접착성 조성물이 바람직하였다. In order to improve the dimensional accuracy of the post-cutting member, hydrophobic and a high bonding strength, and also excellent in removability in water (水中) with no addition, an adhesive residue after peeling member, and environmentally excellent in working efficiency sight going to burn the adjustment of the adhesive composition was preferred. 본 발명의 목적은 이와 같은 특성을 겸비한 접착성 조성물 및 그것을 이용한 부재의 가고정 방법을 제공하는 것에 있다. An object of the present invention is to provide this adhesion combines the following characteristics and composition of the members to go with it fixation method. 본 발명자들은 이들 종래 기술의 문제점을 해결하기 위해서 여러 가지로 검토한 결과, 특정의 소수성 (메타)아크릴 모노머를 이용하여 이것을 조합한 특정 조성의 조성물로서, 상기 조성물로부터 얻어지는 경화체의 유리 전이온도가 -50℃~40℃ 범위 내인 접착성 조성물이 고접착 강도이고 또한 온수 중에서의 박리성이 양호한 접착성 조성물이 상기 본 발명의 목적을 달성하는 것임을 알아내었다. The present inventors have found that a composition of a specific composition by combining this reviewed in a number of in order to solve the problems of the prior art thereof, using the specific hydrophobic (meth) acrylic monomer, the glass transition temperature of the cured body obtained from the composition 50 ℃ ~ 40 ℃ within a range of the adhesive composition and the adhesive strength and also found out that a good releasability of the adhesive composition in warm water to achieve the object of the present invention. 또한, 본 발명자들은 상기 접착성 조성물 중에 특정의 소수성 (메타)아크릴 모노머에 용해하지 않는 입상 물질을 첨가함으로써, 온수 중에서의 박리성이 보다 한층 양호한 접착성 조성물이 되어, 더욱 양호하게 본 발명의 목적을 달성하는 것임을 알아내었다. In addition, the present inventors object of the addition of the particulate material does not dissolve a specific hydrophobic (meth) acrylic monomer, the releasability of from the hot water is a still more preferred adhesive compositions, the more favorable invention in the adhesive composition found out that to achieve. 본 발명은 상기의 신규 발견에 기초를 두는 것이고, 이하의 요지를 갖는다. The present invention is based on the novel finding described above, it has the following subject matter of the. (1) (A) 다관능 (메타)아크릴레이트, (B) 단관능 (메타)아크릴레이트 및 (C) 광중합 개시제를 함유하는 접착성 조성물로서, 상기 접착성 조성물로부터 얻어지는 경화체의 유리 전이온도가 -50℃~40℃인 것을 특징으로 하는 접착성 조성물. (1) (A) a polyfunctional (meth) acrylate, (B) a monofunctional (meth) acrylate and (C) an adhesive composition containing a photo-polymerization initiator, the glass transition temperature of the cured product obtained from the adhesive composition is adhesive composition, characterized in that -50 ℃ ~ 40 ℃. (2) (A) 및 (B)가 모두 소수성인 상기 (1) 기재의 접착성 조성물. (2) (A) and (B) are both hydrophobic adhesive composition of the above (1) above. (3) (A) 및 (B)를 (A):(B)=5:95~95:5(중량부)의 비율로 함유하고, (A) 및 (B)의 합계 100 중량부에 대해서, (C)를 0.1~20 중량부 함유하는 상기 (1) 또는 (2) 기재의 접착성 조성물. (3) (A) and (B) a (A) :( B) = 5: 95 ~ 95: 5 (containing a ratio of parts by weight), with respect to the total 100 parts by weight of (A) and (B) , (C) 0.1 to 20 parts by weight containing the above-mentioned (1) or (2) the adhesive composition of the base material. (4) (A),(B),(C) 중 어느 하나에도 용해하지 않는 입상 물질(D)를 (A) 및 (B)의 합계 100 중량부에 대해서, 0.1~20 중량부 함유하는 상기 (1)~(3) 중 어느 하나에 기재된 접착성 조성물. (4) (A), (B), (C) of any one, even for a particulate material (D) does not dissolve (A) and 100 parts by weight of the total of (B), wherein the containing portion of 0.1 to 20 wt. (1) to (3) of the adhesive composition according to any one. (5) (D)의 비중이 상기 접착성 조성물의 비중과 동일하거나 혹은 작은 상기 (4) 기재의 접착성 조성물. (5) (D) The adhesive composition of the same or less and the specific gravity of the adhesive composition (4) above the base portion. (6) (D)의 형상이 구상인 상기 (4) 또는 (5) 기재의 접착성 조성물. (6) (D), the above (4) or (5) the adhesive composition of the substrate shape of a spherical shape. (7) (D)가 가교 폴리메타크릴산 메틸 입자, 가교 폴리스티렌 입자 및 가교 폴리메타크릴산 메틸 폴리스티렌 공중합체 입자 중 어느 하나 혹은 그 일부 또는 전부의 혼합물인 상기 (4)~(6) 중 어느 하나에 기재된 접착성 조성물. Of (7) (D) a cross-linked polymethyl methacrylate particles, crosslinked polystyrene particles and crosslinked polymethyl methacrylate polystyrene copolymer (4) above which is one or a mixture of any or all of the particles to (6), which adhesive composition according to one. 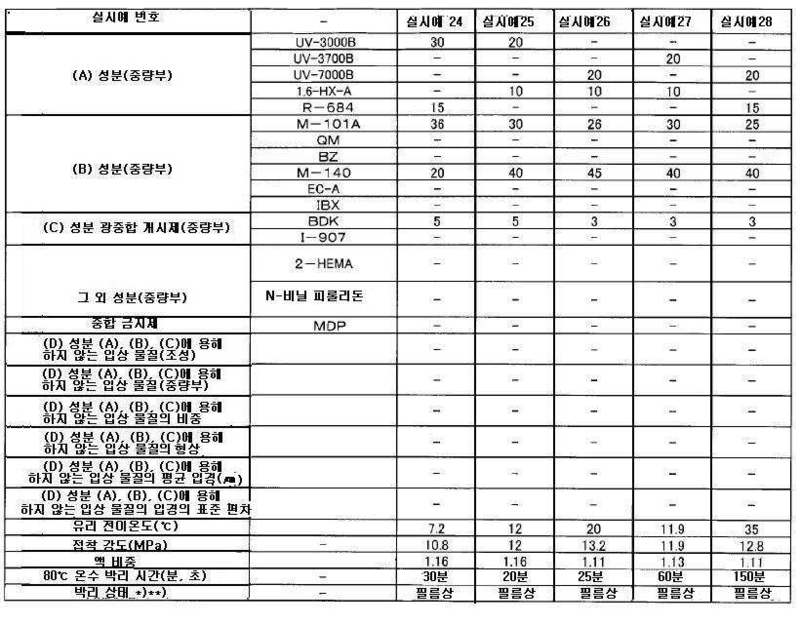 (8) 레이저법에 따른 (D)의 평균 입경이 20~200 ㎛인 상기 (4)~(7) 중 어느 하나에 기재된 접착성 조성물. 8, the average particle diameter of the (D) according to the laser method 20 ~ 200 ㎛ the above (4) to (7) of the adhesive composition according to any one. (9) 레이저법에 따른 (D)의 입경(㎛)을 대수(對數)로 표시했을 때의 입경에 대한 입자 부피 분포의 표준 편차가 0.0001~0.25의 범위에 있는 상기 (4)~(8) 중 어느 하나에 기재된 접착성 조성물. (9) above (4) in the range of the standard deviation of the particle volume distribution to the particle diameter 0.0001 ~ 0.25 when displayed a particle size (㎛) of (D) according to the laser method on a logarithmic (對 數) ~ (8) of the adhesive composition according to any one. (10) 상기 (1)~(9) 중 어느 하나에 기재된 접착성 조성물을 이용하여 부재를 접착하고 고정하여 이루어지는 구조체. 10 (1) to (9) of the adhesive composition structure obtained by bonding and fixing the member by using the according to any one. (11) 상기 (1)~(9) 중 어느 하나에 기재된 접착성 조성물을 이용하여 부재를 접착하고 가고정하여, 상기 가고정된 부재를 가공 후, 상기 가공된 부재를 90℃ 이하의 온수에 침지하여, 상기 접착성 조성물의 경화체를 부재로부터 떼어내는 것을 특징으로 하는 부재의 가고정 방법. 11 (1) to (9) using an adhesive composition according to any one go, and adhering the member of the appointed, the go immersed after the forward member processing, the processed member in warm water of at most 90 ℃ to, temporary fixation method of the member, characterized in that detaching the cured resin of the adhesive composition from the member. 본 발명의 접착성 조성물은 그 조성 때문에 광경화성을 가져, 가시광선 또는 자외선에 의해서 경화한다. The adhesive composition of the present invention bring the photocurable due to its composition and is cured by visible or ultraviolet light. 이 때문에, 종래의 핫멜트계 접착제에 비해, 생력화(省力化, labor saving), 에너지 절약화, 작업 단축의 면에서 현저한 효과를 얻을 수 있다. For this reason, compared to the conventional hot-melt type adhesive, it is possible to obtain a remarkable effect in view of saengryeokhwa (省力 化, labor saving), energy saving, operation speed. 또, 그 경화체는 가공시에 이용하는 절삭수(切削水) 등에 영향을 받지 않고 높은 접착 강도를 발현할 수 있으므로 부재의 가공시에 어긋남(displacement)을 일으키기 어려워, 치수 정밀도 면에서 뛰어난 부재를 용이하게 얻을 수 있다. In addition, the cured body without being affected by cutting can (切削 水) used during processing it is possible to express a high adhesive strength difficult to cause deviation (displacement) at the time of processing of the member, facilitate superior member in dimensional accuracy if It can be obtained. 또한, 해당 경화체는 특히 90℃ 이하의 온수에 접촉함으로써 접착 강도를 저하시켜, 부재간의 혹은 부재와 지그의 접합 강도를 저하시키므로 용이하게 부재를 회수할 수 있다. Further, the cured product in particular can easily recover the member to lower the adhesive strength by contacting the following 90 ℃ hot water, or lowers the bond strength between the member and the fixture member. 종래의 가고정용 접착성 조성물이 가지고 있던, 고가이고 발화성이 강한, 혹은 인체에 유해한 가스를 발생하는 유기용매를 이용할 필요가 있다고 하는 문제도 해소된다. That prior to go with the adjustment of the adhesive composition, it is expensive and is also solved problems that it is necessary to use an organic solvent which is a strong pyrophoric, or generates a gas harmful to the human body. 또한, 본 발명에서의 특정의 바람직한 조성 범위의 접착성 조성물에 있어서는 경화체가 90℃ 이하의 온수와 접촉하여 팽윤해, 필름상으로 부재로부터 회수할 수 있으므로 작업성이 뛰어나다. In addition, since it desirable for certain adhesive composition of the composition range of the present invention in the cured resin swells by contact with warm water of at most 90 ℃, can be recovered from the member in the form of a film superior in workability. 본 발명의 부재의 가고정 방법은 전술한 대로, 90℃ 이하의 온수에 접촉함으로써 접착 강도를 저하시키는 가고정용 접착성 조성물을 이용하고 있으므로 온수에 접촉시키는 것만으로 용이하게 부재를 회수할 수 있다. Going to the member of the present invention fixation method can be recovered easily member only by contact with the hot water, so we use the adjustment adhesive composition going to lower the adhesive strength through contact with warm water of less than 90 ℃ as described above. 종래의 가고정용 접착성 조성물이 가지고 있던, 고가이고 발화성이 강한, 혹은 인체에 유해한 가스를 발생하는 유기용매를 이용할 필요가 있는 것과 같은 문제도 해소된다. That prior to go with the adjustment of the adhesive composition, it is expensive and is also eliminated problems such as that necessary to use an organic solvent which is a strong pyrophoric, or generates a gas harmful to the human body. 본 발명에서 사용하는 (A) 다관능 (메타)아크릴레이트로는 올리고머/폴리머 말단 또는 측쇄에 2개 이상 (메타)아크로일화된 다관능 (메타)아크릴레이트 올리고머/폴리머나, 2개 이상의 (메타)아크로일기를 가지는 다관능 (메타)아크릴레이트 모노머를 사용할 수 있다. Used in the present invention (A) a polyfunctional (meth) acrylate is at least 2 to the oligomer / polymer terminal or side chain (meth) arc anecdotal the polyfunctional (meth) acrylate oligomer / polymer, or two or more (meth ) and is available polyfunctional (meth) acrylate monomer having an arc weather. 예를 들면, 다관능 (메타)아크릴레이트 올리고머/폴리머로는 1,2-폴리부타디엔 말단 우레탄 (메타)아크릴레이트(예를 들면, 일본소다사제 「TE-2000」, 「TEA-1000」), 그 수소 첨가물(예를 들면, 일본소다사제 「TEAI-1000」), 1,4-폴리부타디엔 말단 우레탄 (메타)아크릴레이트(예를 들면, 오사카유기화학사제 「BAC-45」), 폴리이소프렌 말단 (메타)아크릴레이트, 폴리에스테르계 우레탄 (메타)아크릴레이트(예를 들면, 일본합성화학사제 「UV-2000B」, 「UV-3000B」, 「UV-7000B」, 네가미공업사제 「KHP-11」, 「KHP-17」), 폴리에테르계 우레탄 (메타)아크릴레이트(예를 들면, 일본합성화학사제 「UV-3700B」, 「UV-6100B」), 또는 비스 A형 에폭시 (메타)아크릴레이트 등을 들 수 있다. For example, the polyfunctional (meth) acrylate oligomer / polymer include a 1,2-polybutadiene-terminated urethane (meth) acrylate (for example, Japanese Soda Co., Ltd. "TE-2000", "TEA-1000"), the hydrogenated products (for example, Japanese soda Co., Ltd. "TEAI-1000"), 1,4-polybutadiene-terminated urethane (meth) acrylate (for example, Osaka organic chemical Co., Ltd. "BAC-45"), polyisoprene-terminal (meth) acrylate, polyester urethane (meth) acrylate (for example, Japan synthetic chemical Co., Ltd., "UV-2000B", "UV-3000B", "UV-7000B", I mi Ind claim "KHP-11 "," KHP-17 "), polyether-based urethane (meth) acrylate (for example, Japan synthetic chemical Co., Ltd.," UV-3700B "," UV-6100B "), or bis a type epoxy (meth) acrylate and the like. (A) 다관능 (메타)아크릴레이트는 소수성인 것이 보다 바람직하다. (A) a polyfunctional (meth) acrylate is more preferably hydrophobic. 수용성인 경우에는 절삭 가공시에 수지 조성물의 경화체가 팽윤함으로써 위치 어긋남을 일으켜 가공 정밀도가 떨어질 우려가 있기 때문에 바람직하지 않다. If water-soluble, induced by the displacement of the cured resin composition swell during cutting, it is not preferable because there is a fear that machining accuracy drops. 친수성이어도, 그 조성물의 경화체가 물에 의해서 크게 팽윤 혹은 일부 용해하는 일이 없는 경우에는 사용할 수 있다. It may be hydrophilic, if the cured resin of the composition significantly swells or not taking part in dissolution by water may be used. 또한, 본 발명에 있어서, 소수성이란 물에 녹기 어렵거나 혹은 물과 섞이기 어려운 성질을 의미한다. In the present invention, hydrophobic means a difficult is difficult to melt in water, or mixed with water or properties. (A) 다관능 (메타)아크릴레이트의 함유량은 (A):(B)=5:95~95:5(중량부)인 것이 바람직하다. (A) a polyfunctional (meth) acrylate content of the (A) :( B) = 5: 95 ~ 95: to 5 (parts by weight) is preferred. 즉, (A) 및 (B)의 합계량 100 중량부 중, 1~50 중량부가 바람직하다. That is, the addition of 1 to 50 parts by weight of 100 parts by weight of the total amount of (A) and (B), is preferred. 1 중량부 이상이면, 조성물의 경화체를 온수에 침지했을 때 피착물로부터 해당 경화체가 박리하는 성질(이하, 단지 「박리성」이라고 한다)이 충분히 조장되고, 조성물의 경화체가 필름상으로 박리하는 것을 확보할 수 있다. 1 is part by weight or more, (hereinafter referred to as just "releasable") when immersing the cured product of the composition in hot water from the adherend the property of the cured product is peeled off is the promotion and, peeling the cured product of the composition is in the form of a film sufficiently It can be secured. 또, 50 중량부 이하이면, 초기의 접착성이 저하할 우려도 없다. In addition, if more than 50 parts by weight, there is no possibility that the initial adhesion decreases. (A) 다관능 (메타)아크릴레이트의 함유량은 (A) 및 (B)의 합계량 100 중량부 중, 20~60 중량부가 더욱 바람직하다. (A) a polyfunctional (meth) acrylate content of the (A) is and (B), more preferably the total amount of 100 parts by weight, 20 to 60 parts by weight of. (B) 단관능 (메타)아크릴레이트 모노머로는 메틸 (메타)아크릴레이트, 에틸 (메타)아크릴레이트, 프로필 (메타)아크릴레이트, 부틸 (메타)아크릴레이트, 2-에틸헥실 (메타)아크릴레이트, 이소옥틸 (메타)아크릴레이트, 이소데실 (메타)아크릴레이트, 라우릴 (메타)아크릴레이트, 스테아릴 (메타)아크릴레이트, 페닐 (메타)아크릴레이트, 시클로헥실 (메타)아크릴레이트, 디시클로펜타닐 (메타)아크릴레이트, 디시클로펜테닐 (메타)아크릴레이트, 디시클로펜테닐옥시에틸 (메타)아크릴레이트, 이소보닐 (메타)아크릴레이트, 메톡시화 시클로데카트리엔 (메타)아크릴레이트, 2-히드록시에틸 (메타)아크릴레이트, 2-히드록시프로필 (메타)아크릴레이트, 3-히드록시프로필 (메타)아크릴레이트, 4-히드록시부틸 (메타)아크릴레이트, 테트라히드로푸르푸릴 (메타)아크 (B) a monofunctional (meth) acrylate monomers include methyl (meth) acrylate, ethyl (meth) acrylate, propyl (meth) acrylate, butyl (meth) acrylate, 2-ethylhexyl (meth) acrylate , isooctyl (meth) acrylate, isodecyl (meth) acrylate, lauryl (meth) acrylate, stearyl (meth) acrylate, phenyl (meth) acrylate, cyclohexyl (meth) acrylate, dicyclopentyl fentanyl (meth) acrylate, dicyclopentenyl (meth) acrylate, dicyclopentenyl oxyethyl (meth) acrylate, isobornyl (meth) acrylate, methoxylated cyclohexyl decatriene (meth) acrylate, 2 -hydroxyethyl (meth) acrylate, 2-hydroxypropyl (meth) acrylate, 3-hydroxypropyl (meth) acrylate, 4-hydroxybutyl (meth) acrylate, tetrahydrofurfuryl (meth) Ark 레이트, 2-히드록시-3-페녹시프로필 (메타)아크릴레이트, 글리시딜 (메타)아크릴레이트, 카프로락톤 변성 테트라히드로푸르푸릴 (메타)아크릴레이트, 3-클로로-2-히드록시프로필 (메타)아크릴레이트, N,N-디메틸아미노에틸 (메타)아크릴레이트, N,N-디에틸아미노에틸 (메타)아크릴레이트, t-부틸아미노에틸 (메타)아크릴레이트, 에톡시카르보닐메틸 (메타)아크릴레이트, 페놀에틸렌옥사이드 변성 아크릴레이트, 페놀(에틸렌옥사이드 2몰 변성) 아크릴레이트, 페놀(에틸렌옥사이드 4몰 변성) 아크릴레이트, 파라큐밀페놀 에틸렌옥사이드 변성 아크릴레이트, 노닐페놀 에틸렌옥사이드 변성 아크릴레이트, 노닐페놀(에틸렌옥사이드 4몰 변성) 아크릴레이트, 노닐페놀(에틸렌옥사이드 8몰 변성) 아크릴레이트, 노닐페놀(프로필렌옥사이드 2.5몰 변성) 아크릴레이 Acrylate, 2-hydroxy-3-phenoxypropyl (meth) acrylate, glycidyl (meth) acrylate, caprolactone-modified tetrahydrofurfuryl (meth) acrylate, 3-chloro-2-hydroxypropyl ( meth) acrylate, N, N- dimethylaminoethyl (meth) acrylate, N, N- diethylaminoethyl (meth) acrylate, t- butylaminoethyl (meth) acrylate, ethoxycarbonylmethyl (meth ) acrylate, phenol ethylene oxide modified acrylate, phenol (ethylene oxide 2 mol modified) acrylate, phenol (ethylene oxide 4 mol modified) acrylate, p-cumylphenol ethylene oxide modified acrylate, nonylphenol ethylene oxide modified acrylate, nonyl phenol (ethylene oxide 4 mol modified) acrylate, nonylphenol (ethylene oxide 8 mol modified) acrylate, nonylphenol (propylene oxide 2.5 mol modified) acrylate ray , 2-에틸헥실카비톨 아크릴레이트, 에틸렌옥사이드 변성 프탈산 (메타)아크릴레이트, 에틸렌옥사이드 변성 숙신산 (메타)아크릴레이트, 트리플루오로에틸 (메타)아크릴레이트, 아크릴산, 메타크릴산, 말레인산, 푸말산, ω-카르복시-폴리카프로락톤 모노(메타)아크릴레이트, 프탈산 모노히드록시에틸 (메타)아크릴레이트, (메타)아크릴산 다이머, β-(메타)아크로일옥시에틸 하이드로젠 숙시네이트, n-(메타)아크릴로일옥시알킬 헥사히드로프탈이미드, 2-(1,2-시클로헥사카르복시이미드)에틸 아크릴레이트, 에톡시디에틸렌글리콜 디아크릴레이트, 벤질메타크릴레이트 등을 들 수 있다. , 2-ethylhexyl carbitol acrylate, ethylene oxide-modified phthalic acid (meth) acrylate, ethylene oxide-modified succinic acid (meth) acrylate, trifluoro ethyl (meth) acrylate, acrylic acid, methacrylic acid, maleic acid, fumaric acid , ω- carboxy-polycaprolactone mono (meth) acrylate, phthalic acid mono hydroxyethyl (meth) acrylate, (meth) acrylic acid dimer, β- (meth) arc oxyethyl hydrogen succinate, n- (meth ) is something oxyalkylene-hexahydro-phthalimido-acryloyl include imide, 2- (1,2-cyclohexadiene dicarboxyimide) acrylate, ethoxy CD glycol diacrylate, benzyl methacrylate and the like. (B) 단관능 (메타)아크릴레이트는 (A)와 같이 소수성인 것이 보다 바람직하다. (B) a monofunctional (meth) acrylate is more preferably hydrophobic as (A). 수용성인 경우에는 절삭 가공시에 수지 조성물의 경화체가 팽윤함으로써 위치 어긋남을 일으켜 가공 정밀도가 떨어질 우려가 있기 때문에 바람직하지 않다. If water-soluble, induced by the displacement of the cured resin composition swell during cutting, it is not preferable because there is a fear that machining accuracy drops. 또, 친수성이어도, 그 수지 조성물의 경화체가 물에 의해서 팽윤 혹은 일부 용해하는 것이 없는 경우에는 사용할 수 있다. In addition, there may be used may be hydrophilic, if the cured product of the resin composition not to swell or partially dissolved by the water. (B) 단관능 (메타)아크릴레이트의 함유량은 상술한 대로, (A):(B)=5:95~95:5(중량부)인 것이 바람직하다. (B) a monofunctional (meth) acrylate content of the above-mentioned as, (A) :( B) = 5: is preferably 5 (parts by weight): 95-95. 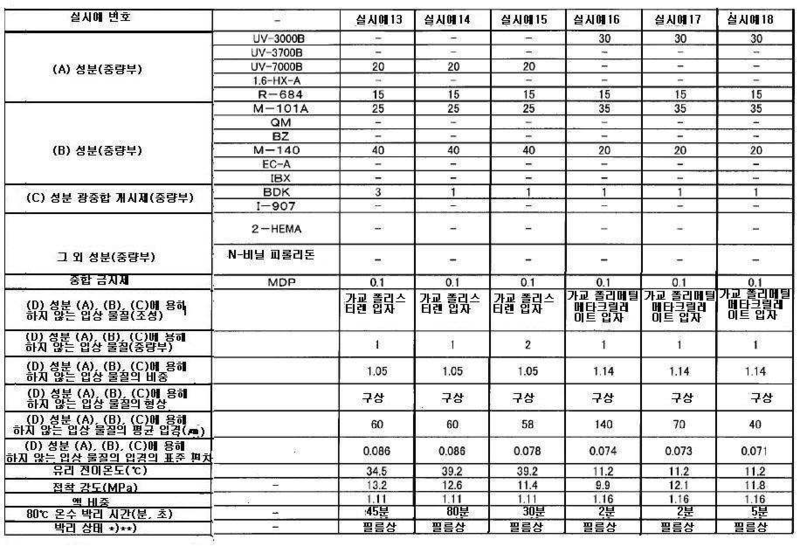 즉, (A) 및 (B)의 합계량 100 중량부 중, 5~95 중량부가 바람직하다. That is, (A) it is and the (B) 100 parts by weight of, preferably 5 to 95 parts by weight of the total amount. 5 중량부 이상이면 초기의 접착성이 저하할 우려도 없고, 95 중량부 이하이면, 박리성을 확보할 수 있어 조성물의 경화체가 필름상으로 박리한다. 5 parts by weight or more and is also a peeling onto the rear surface portion 95 parts by weight or less, it is possible to ensure the releasability of the cured resin composition loaded with no fear of the adhesion of initial degradation. (B) 단관능 (메타)아크릴레이트의 함유량은 (A) 및 (B)의 합계량 100 중량부 중, 40~80 중량부가 더욱 바람직하다. (B) a monofunctional (meth) acrylate content of the (A) is and (B), more preferably the total amount of 100 parts by weight, 40 to 80 parts by weight of. 또, 상기 (A) 및 (B)의 배합 조성물에, (메타)아크릴로일옥시에틸산 포스페이트, 디부틸 2-(메타)아크릴로일옥시에틸산 포스페이트, 디옥틸 2-(메타)아크릴로일옥시에틸 포스페이트, 디페닐 2-(메타)아크릴로일옥시에틸 포스페이트, (메타)아크릴로일옥시에틸 폴리에틸렌글리콜산 포스페이트 등의, 비닐기 또는 (메타)아크릴기를 가지는 인산 에스테르를 병용함으로써 금속면에 대한 밀착성을 더욱 향상시킬 수 있다. Further, the (A) and (B) in the mixed composition, (meth) by oxyethyl acid phosphate, dibutyl 2- (meth) acryloyl oxyethyl acid phosphate, dioctyl 2- (meth) acrylate of by combined use of a surface metal oxyethyl phosphate, diphenyl 2- (meth) acryloyloxyethyl phosphate and (meth) such as acryloyloxyethyl polyethylene glycol acid phosphate, a vinyl group or (meth) acrylic acid ester having an the adhesion to be improved further. (C) 광중합 개시제는 가시광선이나 자외선의 활성 광선에 의해 증감시켜 수지 조성물의 광경화를 촉진하기 위해서 배합하는 것이고, 공지의 각종 광중합 개시제가 사용 가능하다. (C) a photopolymerization initiator was increased or decreased by the active light in the visible or ultraviolet light is to compounding in order to promote photocuring of the resin composition, it is possible to use various photopolymerization initiators known in the art. 구체적으로는 벤조페논 또는 그 유도체; Specifically, benzophenone or its derivative; 벤질 또는 그 유도체; Benzyl or its derivative; 안트라퀴논 또는 그 유도체; Anthraquinone or its derivative; 벤조인; Benzoin; 벤조인메틸에테르, 벤조인에틸에테르, 벤조인프로필에테르, 벤조인이소부틸에테르, 벤질디메틸케탈 등의 벤조인 유도체; Benzoin methyl ether, benzoin ethyl ether, benzoin propyl ether, benzoin isobutyl ether, benzyl dimethyl ketal, benzoin derivatives such as; 디에톡시아세토페논, 4-t-부틸트리클로로아세토페논 등의 아세토페논 유도체; Diethoxyacetophenone, acetophenone derivatives such as acetophenone with 4-t- butyl-trichloro; 2-디메틸아미노에틸벤조에이트; 2-dimethylaminoethyl benzoate; p-디메틸아미노에틸벤조에이트; p- dimethylaminoethyl benzoate; 디페닐디설파이드; Diphenyl disulfide; 티옥산톤 또는 그 유도체; Thioxanthone and its derivatives; 캠퍼-퀴논; Camper-quinone; 7,7-디메틸-2,3-디옥소비시클로[2.2.1]헵탄-1-카르복시산, 7,7-디메틸-2,3-디옥소비시클로[2.2.1]헵탄-1-카르복시-2-브로모에틸 에스테르, 7,7-디메틸-2,3-디옥소비시클로[2.2.1]헵탄-1-카르복시-2-메틸 에스테르, 7,7-디메틸-2,3-디옥소비시클로[2.2.1]헵탄-1-카르복시산 클로라이드 등의 캠퍼-퀴논 유도체; 7,7-dimethyl-2,3-dioxide consumption [2.2.1] heptane-1-carboxylic acid, 7,7-cyclohexane-dimethyl-2,3-dioxide consumption [2.2.1] heptane-1-carboxy-2 bromoethyl ester, 7,7-dimethyl-2,3-dioxide consumption [2.2.1] heptane-1-carboxy-2-methyl ester, 7,7-dimethyl-2,3-dioxide consumption bicyclo [2.2. 1] heptane-1-carboxylic acid chloride, such as camphor-quinone derivatives; 2-메틸-1-[4-(메틸티오)페닐]-2-모르폴리노프로판-1-온, 2-벤질-2-디메틸아미노-1-(4-모르폴리노페닐)-부타논-1 등의 α-아미노알킬페논 유도체; 2-methyl-1- [4- (methylthio) phenyl] -2-morpholino-1-one, 2-benzyl-1- (4-morpholinophenyl) - butanone- 1, such as the α- aminoalkyl benzophenone derivatives; 벤조일 디페닐 포스핀 옥사이드, 2,4,6-트리메틸 벤조일 디페닐 포스핀 옥사이드, 벤조일 디에톡시 포스핀 옥사이드, 2,4,6-트리메틸 벤조일 디메톡시 페닐 포스핀 옥사이드, 2,4,6-트리메틸 벤조일 디에톡시 페닐 포스핀 옥사이드 등의 아실 포스핀 옥사이드 유도체 등을 들 수 있다. Benzoyl diphenyl phosphine oxide, 2,4,6-trimethylbenzoyl diphenyl phosphine oxide, benzoyl diethoxy-phosphine oxide, 2,4,6-trimethyl benzoyl dimethoxyphenyl phosphine oxide, 2,4,6-trimethyl and the like can be mentioned benzoyl diethoxy-phenyl phosphine oxide, such as acylphosphine oxide derivatives. 광중합 개시제는 1종 또는 2종 이상을 조합하여 이용할 수 있다. The photopolymerization initiator may be used alone or in combination of two or more thereof. (C) 광중합 개시제의 함유량은 (A) 및 (B)의 합계 100 중량부에 대해서, 0.1~20 중량부가 바람직하고, 0.5~10 중량부가 보다 바람직하다. (C) about 100 parts by weight of the total of the content of the photopolymerization initiator (A) and (B), and preferably 0.1 to 20 parts by weight, more preferably 0.5 to 10 parts by weight. 0.1 중량부 이상이면, 경화 촉진의 효과를 확실히 얻을 수 있고, 20 중량부 이하이면 충분한 경화 속도를 얻을 수 있다. If more than 0.1 part by weight, it is possible to surely achieve the effect of promoting the curing, is not more than 20 parts by weight can be obtained a sufficient cure speed. (C) 성분을 1 중량부 이상 첨가하는 것은 광 조사량에 의존하지 않고 경화 가능해져, 조성물의 경화체의 가교도가 더욱 높아져, 절삭 가공시에 위치 어긋남 등을 일으키지 않게 되는 점이나 박리성이 향상하는 점에서 더욱 바람직하다. The (C) adding more than 1 part by weight of the component point without depending on the light irradiation amount curable becomes, the cured body, the degree of crosslinking is further increased in the composition, increase the point or peelability which does not cause such position during cutting, shift and more preferably from. 본 발명에서는 접착성 조성물로부터 얻어지는 경화체의 유리 전이온도가 -50℃~40℃의 범위 내인 것이 필수이다. It is essential in the present invention, the range of the glass transition temperature of the cured -50 ℃ ~ 40 ℃ obtained from the adhesive composition. 상기 접착성 조성물로부터 얻어지는 경화체의 유리 전이온도가 이 범위 내에 있는 것에 의해, 상기 접착제 조성물을 이용하여, 부재를 접착 가고정하여, 상기 가고정된 부재를 가공 후, 상기 가공된 부재를 90℃ 이하의 온수에 침지했을 때, 접착성 조성물의 경화체 자체가 크게 열팽창하고, 그 결과, 접착 면적의 감소가 달성되어 접착 강도가 저하함으로써 용이하게 부재만을 회수할 수 있다. The glass transition temperature of the cured product obtained from the adhesive composition by within this range, by using the adhesive composition, appointed to go bond the members, the go after the forward member machining, of less than 90 ℃ the processed member when immersed in water, the adhesive composition and the cured product is larger thermal expansion itself, and as a result, a reduction in adhesion area is achieved can be easily recovered the member by the adhesive strength decreases. 접착성 조성물로부터 얻어지는 경화체의 유리 전이온도가 -50℃ 이하이면 박리성은 향상하지만 가고정한 부재의 가공시에 어긋남을 일으키기 쉽고, 치수 정밀도 면에서 떨어진다. If the glass transition temperature of the cured product obtained from the adhesive composition or less -50 ℃ separation is improved, but to go easy to cause misalignment during machining of the set member, it drops in terms of dimensional accuracy. 박리성과 치수 정밀도의 관점으로부터 상기 접착성 조성물로부터 얻어지는 경화체의 유리 전이온도의 보다 바람직한 범위는 -25℃~35℃이며, 더욱 바람직하게는 -20℃~25℃이며, 더욱 더 한층 바람직하게는 0℃~20℃이다. More preferable range of the glass transition temperature of the cured product obtained from the adhesive composition from the viewpoints of the release and the dimensional accuracy is -25 ℃ ~ 35 ℃, more preferably from -20 ℃ ~ 25 ℃, and more further preferably 0 a ℃ ~ 20 ℃. 또한, 본 발명에서 이용되는 접착성 조성물로부터 얻어지는 경화체의 유리 전이온도의 측정 방법은 특별히 제한은 없지만, DSC(Differential scanning calorimetry)나 동적점탄성 스펙트럼 등의 공지의 방법으로 측정되고 바람직하게는 동적점탄성 스펙트럼이 이용된다. Further, the glass transition temperature of the cured product measuring method obtained from the adhesive composition used in the present invention is not particularly limited, but, DSC (Differential scanning calorimetry) and is measured by a known method such as dynamic viscoelasticity spectrum and preferably dynamic viscoelasticity spectrum this is used. 본 발명에서는 (A), (B), (C) 중 어느 하나에도 용해하지 않는 입상 물질(D)(이하, 입상 물질(D), 또는 단순히 (D)라고도 한다)를, (A)~(C)와 함께 이용해도 된다. In the present invention, (A), the (B), (hereinafter, also referred to as particulate matter (D), or simply as (D)) which also does not dissolve the particulate material one (D) of the (C), (A) ~ ( It may be used with a C). 이것에 의해, 경화 후의 조성물이 일정한 두께를 유지할 수 있기 때문에, 가공 정밀도가 향상한다. As a result, since the composition after curing to maintain a predetermined thickness, thereby improving the processing accuracy. 또한, 접착성 조성물의 경화체와 입상 물질(D)의 선팽창 계수가 다른 것으로부터, 상기 접착제 조성물을 이용하여 부재를 접착 가고정하여, 상기 가고정된 부재를 가공 후, 상기 가공된 부재를 90℃ 이하의 온수에 침지했을 때, 부재와 접착성 조성물의 경화체의 계면에 굽이치는 모양 내지 삼차원적 변형이 생겨 그 결과, 접착 면적의 감소가 달성되어 박리성이 보다 한층 향상한다. In addition, the linear expansion coefficients from one another in the cured product and the particulate material (D) of the adhesive composition, appointed to go bonding a member by using the adhesive composition, the go after the forward member Processing, 90 ℃ the processed member or less when immersed in warm water, the member and the undulating shape of the adhesive interface to the three-dimensional deformation of a cured body of the composition blossomed as a result, a reduction in the bonding area is attained and releasability is further improved further. 입상 물질(D)의 재질로는 일반적으로 사용되는 유기 입자, 또는 무기 입자 중 어느 것이어도 상관없다. As a material of the granular material (D) is not generally matter it may be either organic particles or inorganic particles to be used. 구체적으로는 유기 입자로는 폴리에틸렌 입자, 폴리프로필렌 입자, 가교 폴리메타크릴산 메틸 입자, 가교 폴리스티렌 입자 등을 들 수 있다. Specifically, as the organic particles and the like can be polyethylene particles, polypropylene particles, crosslinked polymethyl methacrylate particles, crosslinked polystyrene particles. 무기 입자로는 유리, 실리카, 알루미나, 티탄 등 세라믹 입자를 들 수 있다. The inorganic particles can be ceramic particles such as glass, silica, alumina, titanium. 입상 물질(D)의 비중은 접착성 조성물의 비중과 동일하거나 혹은 작은 것이 바람직하다. Specific gravity of the granular material (D) is preferably equal to or smaller and the adhesive composition weight. (D)의 비중이 접착성 조성물의 비중보다 크면 접착성 조성물 내에서 침전해버려 상기 입상 물질이 접착성 조성물 내에서 충분히 분산하지 않는다. (D) away to the specific gravity is precipitated in a proportion greater than the adhesive composition of the adhesive composition does not have the particulate material fully dispersed in the adhesive composition. 입상 물질의 비중이 접착성 조성물의 비중과 동일하거나 혹은 작으면 상기 입상 물질이 접착성 조성물 내에서 용이하게 분산하여 가고정한 부재를 가공할 때의 치수 정밀도 및 박리성이 향상한다. If the specific gravity of the particulate material the same as the specific gravity of the adhesive composition or less, or to improve the dimensional accuracy and the releasability when the particulate material to the processing element determined to go to readily disperse in the adhesive composition. 입상 물질의 비중이 접착성 조성물의 비중보다 작은 경우에서도, 입상 물질의 비중과 접착성 조성물의 비중의 차이는 바람직하게는 1.5 이내 특히 바람직하게는 0.01 이내인 것이 매우 적합하다. Even if the specific gravity of the particulate material is less than the specific gravity of the adhesive composition, the difference in specific gravity with the specific gravity of the adhesive composition of the particulate material is well suited to and preferably is within the most preferably within 0.01 1.5. 입상 물질(D)은 가공 정밀도의 향상, 즉 접착제의 막 두께의 제어의 관점으로부터 구상인 것이 바람직하다. Particulate matter (D) is preferably spherical from the improvement of the machining accuracy, that is, the point of view of control of the thickness of the adhesive. 구체적으로, 유기 입자로는 메타크릴산 메틸 모노머 및/또는 스티렌 모노머와 가교성 모노머의 공지의 유화 중합법에 의해 단분산 입자로서 얻어지는 가교 폴리메타크릴산 메틸 입자, 가교 폴리스티렌 입자, 또는 가교 폴리메타크릴산 메틸 폴리스티렌 공중합체 입자가 바람직하다. Specifically, the organic particles include methyl methacrylate monomer and / or cross-linked polymethyl methacrylate particles, crosslinked polystyrene particles or crosslinked poly obtained as monodispersed particles by the emulsion polymerization method known in the styrene monomer and the crosslinking monomer the methacrylic acid methyl polystyrene copolymer particles. 무기 입자로는 구상 실리카가 입자의 변형이 적고, 입경의 불균일(fluctuation)에 의한 경화 후의 조성물의 막 두께의 불균일이 적게 되기 때문에 바람직하다. The inorganic particles are preferable because the spherical silica particles is less of variation, the film non-uniformity in the thickness of the composition after curing by non-uniformity (fluctuation) of a particle size less. 그 중에서도, 나아가 입자의 침강 등에 따른 저장 안정성이나 조성물의 반응성의 관점으로부터, 가교 폴리메타크릴산 메틸 입자, 가교 폴리스티렌 입자 및 가교 폴리메타크릴산 메틸 폴리스티렌 공중합체 입자 중 어느 하나 혹은 그들의 혼합물이 보다 한층 바람직하다. From among them, and furthermore the point of view of the reactivity of the storage stability, the composition according to the like of the particles precipitated, the crosslinked polymethyl methacrylate particles, crosslinked polystyrene particles and crosslinked polymethyl methacrylate any one or mixtures thereof of acid methyl polystyrene copolymer particles more than desirable. 입상 물질(D)의 레이저법에 따르는 평균 입경은 20~200 ㎛의 범위에 있는 것이 바람직하다. The average particle diameter according to the laser method of the granular material (D) is preferably in the range of 20 ~ 200 ㎛. 상기 입상 물질의 평균 입경이 20 ㎛ 미만이면 박리성이 떨어지고, 200 ㎛ 이상이면 가고정한 부재의 가공시에 어긋남을 일으키기 쉽고, 치수 정밀도 면에서 떨어진다. When the average particle size of the particulate material is less than 20 ㎛ poor removability, and easy to cause misalignment during processing of the member specified by going back more than 200 ㎛, it drops in terms of dimensional accuracy. 박리성과 치수 정밀도의 관점으로부터 보다 바람직한 평균 입경은 35 ㎛~150 ㎛이며, 더욱 바람직하게는 50 ㎛~120 ㎛이다. A more preferable average particle diameter from the viewpoint of separation and dimensional accuracy is 35 ㎛ ~ 150 ㎛, and more preferably from 50 ㎛ ~ 120 ㎛. 또한, 본 발명에서의 입자 지름 및 입경 분포의 표준 편차는 시마즈 제작소제 「레이저 회절식 입도 분포 측정 장치 SALD-2200」에 의해 측정했다. Further, the standard deviation of the particle size and particle size distribution of the invention is in, manufactured by Shimadzu Corporation was measured by the "laser diffraction particle size distribution analyzer SALD-2200." 또, 입상 물질(D)의 입경의 레이저법에 따른 입경(㎛)을 대수로 표시했을 때의 입경에 대한 입자 부피 분포의 표준 편차는 0.0001~0.25의 범위에 있는 것이 바람직하다. The standard deviation of the particle volume distribution to the particle size when the particle size (㎛) according to the laser method of the particle size of the granular material (D) have been represented by the number is preferably in the range of 0.0001 ~ 0.25. 이 범위에 입상 물질의 입경의 표준 편차가 있으면 입경의 불균일에 의한 경화 후의 조성물의 막 두께의 불균일이 적게 되어, 가고정한 부재의 가공시의 어긋남이 생기기 어렵고 치수 정밀도 면에서 뛰어날 뿐만 아니라 박리성도 현저하게 향상한다. If the standard deviation of the particle size of the particulate material in this range is less film non-uniformity in the thickness of the composition after curing by non-uniformity of the particle size, go not only excel in is difficult to the deviation at the time of processing dimensional accuracy and surface of the member set significantly Chengdu peeling to be improved. 치수 정밀도 및 박리성의 관점으로부터 입상 물질의 입경의 표준 편차는 0.0001~0.15이면 더욱 바람직하고, 0.0001~0.1이면 보다 한층 바람직하고, 0.0001~0.08이면 더욱 더 한층 바람직하고 0.0001~0.072이면 현저하게 바람직하다. If the dimensional accuracy and the standard deviation of the particle size of the particulate material from the peeling viewpoint 0.0001 ~ 0.15 is more preferable, 0.0001 ~ 0.1 is more preferred, and 0.0001 ~ 0.08 is more further preferably 0.0001 ~ 0.072 than it is remarkably preferable. 입상 물질(D)의 함유량은 접착 강도, 가공 정밀도, 박리성의 관점으로부터 (A) 및 (B)의 합계량 100 중량부에 대해서, 0.1~20 중량부가 바람직하고, 보다 바람직하게는 0.2~10 중량부, 더욱 한층 바람직하게는 0.2~6 중량부의 범위에 있으면 좋다. The content of the granular material (D) is, based on 100 parts by weight of the total amount of the adhesive strength, processing accuracy, from peeling the viewpoint (A) and (B), and 0.1 to 20 parts by weight, more preferably 0.2 to 10 parts by weight , even more preferably it may be in the range 0.2 to 6 wt parts. 본 발명의 접착성 조성물에 있어서는 그 저장 안정성 향상을 위해 소량의 중합 금지제를 사용할 수 있다. In the adhesive composition of the invention may be used with a small amount of a polymerization inhibitor for the storage reliability. 예를 들면 중합 금지제로는 메틸 하이드로퀴논, 하이드로퀴논, 2,2-메틸렌-비스(4-메틸-6-터셔리부틸페놀), 카테콜, 하이드로퀴논 모노메틸 에테르, 모노터셔리부틸하이드로퀴논, 2,5-디터셔리부틸하이드로퀴논, p-벤조퀴논, 2,5-디페닐-p-벤조퀴논, 2,5-디터셔리부틸-p-벤조퀴논, 피크르산, 시트르산, 페노티아진, 터셔리부틸카테콜, 2-부틸-4-히드록시 아니솔 및 2,6-디터셔리부틸-p-크레졸 등을 들 수 있다. For example, the polymerization inhibitor include methyl hydroquinone, hydroquinone, 2,2-methylene-bis (4-methyl-6-tert-butylphenol), catechol, hydroquinone monomethyl ether, mono tert-butyl hydroquinone, 2,5 dither tert-butyl hydroquinone, p- benzoquinone, 2,5-diphenyl -p- benzoquinone, 2,5-tert-butyl-Dieter -p- benzoquinone, picric acid, citric acid, phenothiazine, tertiary butyl catechol, and the like of 2-butyl-4-hydroxy-anisole and 2,6-tert-butyl-Dieter -p- cresol. 이들 중합 금지제의 사용량은 (메타)아크릴산 에스테르 모노머 100 중량부에 대해, 0.001~3 중량부가 바람직하고, 0.01~2 중량부가 보다 바람직하다. The amount of the polymerization inhibitor is a (meth) based on 100 parts by weight of acrylate monomer, and 0.001 ~ 3 parts by weight preferably, and more preferably 0.01 to 2 parts by weight. 0.001 중량부 이상으로 저장 안정성이 확보되고, 3 중량부 이하로 양호한 접착성을 얻을 수 있고 미경화가 되는 일도 없다. 0.001 and a storage stability obtained in parts by weight or more, to obtain good adhesion to less than 3 parts by weight, no work is upset microscope. 본 발명에 있어서는 극성 유기용매를 함께 이용해도 된다. According to the present invention it may be used with a polar organic solvent. 극성 유기용매를 함께 이용함으로써, 경화 후의 조성물이 온수와 접촉하여 용이하게 팽윤하거나 하여 접착 강도가 저하하는 현상을 확실히 발현할 수 있다. By using a polar organic solvent together, and the composition after curing or easily swells in contact with water it is possible to certainly develop the phenomenon in which the adhesive strength decreases. 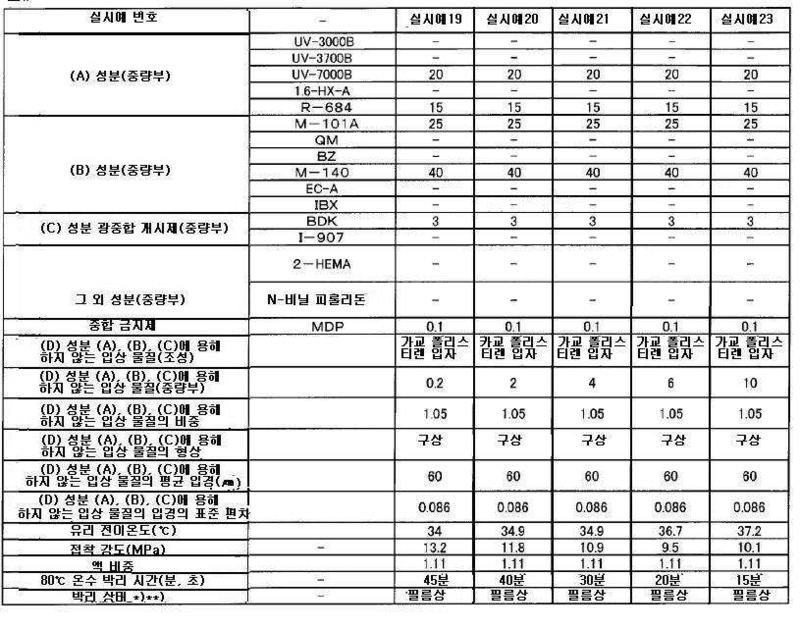 극성 유기용매에 관해서는 그 비점이 50℃ 이상 200℃ 이하인 것이 바람직하고, 55℃ 이상 100℃ 이하인 것이 더욱 바람직하다. As for the polar organic solvent has a boiling point that is more preferably not more than more than desirable, and 55 ℃ or less than 50 ℃ 200 ℃ 100 ℃. 비점이 상기 범위 내인 극성 유기용매를 선택하면, 경화 후의 조성물이 온수와 접촉하여 접착 강도가 저하하는 현상을 보다 한층 확실히 발현할 수 있으므로 바람직하다. When a boiling point is selected, the polar organic solvent is within the above range, it is preferable because the composition after curing can be more reliably the symptoms that are expressed even in contact with the hot water decrease the adhesive strength. 또, 이와 같은 극성 유기용매로는 예를 들면, 알코올, 케톤, 에스테르 등을 들 수 있지만, 발명자의 검토 결과에 의하면, 이 중 알코올이 바람직하게 선택된다. In addition, these polar organic solvents, such as, for example, in the review of alcohols, ketones, there can be an ester, the inventors, this is preferably selected from alcohols. 알코올로는 메탄올, 에탄올, n-프로판올, 이소프로판올, n-부탄올, 이소부탄올, 제2부탄올, 제3부탄올, n-아밀 알코올, 이소아밀 알코올, 또는 2-에틸 부틸 알코올 등을 들 수 있다. The alcohol is methanol, ethanol, n- propanol, isopropanol, n- butanol, isobutanol, 2-butanol, 3-butanol, n- amyl alcohol, isoamyl alcohol or 2-ethylbutyl alcohol, and the like. 또한, 상기 알코올 중에서도, 비점이 120℃ 이하인 메탄올, 에탄올, n-프로판올, 이소프로판올, n-부탄올, 이소부탄올, 제2부탄올, 또는 제3부탄올이 바람직하고, 그 중에서도 메탄올, 에탄올, 이소프로판올, 또는 n-부탄올이 한층 바람직하다. Further, among the alcohols, the boiling point is not more than 120 ℃ methanol, ethanol, n- propanol, isopropanol, n- butanol, isobutanol, 2-butanol, or 3-butanol is preferable, and among them, methanol, ethanol, isopropanol, or n -butanol is more preferable. 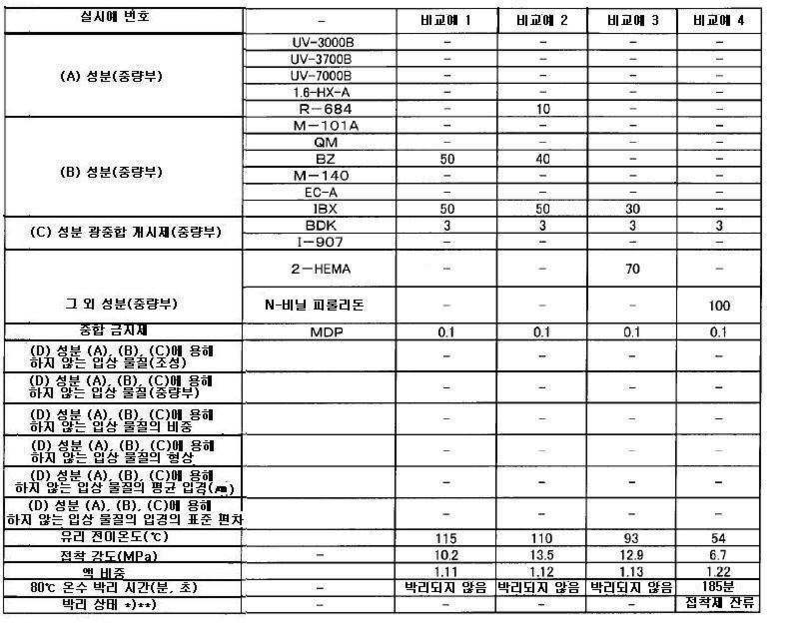 극성 유기용매의 첨가량은 (A) 및 (B)의 합계량 100 중량부에 대해서, 0.5~10 중량부가 바람직하고, 1~8 중량부가 더욱 바람직하다. Based on 100 parts by weight of the total amount of the added amount of the polar organic solvent (A) and (B), 0.5 ~ 10 parts by weight preferred, and 1-8 parts by weight is more preferably added. 0.5 중량부 이상이면 박리성을 확보할 수 있고, 10 중량부 이하이면, 초기의 접착성이 저하할 우려도 없고, 조성물의 경화체가 필름상으로 박리한다. If more than 0.5 parts by weight or less can be secured to a releasable, 10 parts by weight, and no fear of the decrease of the initial adhesion, and the peeling of the composition onto the cured resin film. 본 발명의 조성물은 본 발명의 목적을 손상시키지 않는 범위에서 일반적으로 사용되고 있는 아크릴 고무, 우레탄 고무, 아크릴로니트릴-부타디엔-스티렌 고무 등의 각종 엘라스토머, 무기 필러, 용제, 증량재, 보강재, 가소제, 증점제, 염료, 안료, 난연제, 실란커플링제, 또는 계면활성제 등의 첨가제를 사용해도 된다. The compositions of the present invention is an acrylic rubber, urethane rubber, acrylonitrile which is generally used in a range that does not impair the objects of the present invention-butadiene-various elastomers such as styrene rubber, an inorganic filler, a solvent, increased material, reinforcing material, a plasticizer, It may be used an additive such as a thickener, a dye, a pigment, a flame retardant, a silane coupling agent, or a surfactant. 다음에, 본 발명에 의한 부재의 가고정 방법에 있어서는 상술한 본 발명의 접착성 조성물을 이용하여 부재를 접착하고, 조성물을 경화하여 가고정하여, 상기 가고정된 부재를 가공 후, 상기 가공된 부재를 90℃ 이하의 온수에 침지하여, 상기 접착성 조성물의 경화체를 부재로부터 떼어낸다. Next, go to the members of the present invention to go to bond the In member using the adhesive composition of the present invention described above in the fixation method, and curing the composition appointed, the go a then the forward member processing, the processing member immersed in warm water of at most 90 ℃, and remove the cured resin of the adhesive composition from the member. 이것에 의해, 유기용제를 이용하는 일 없이 광학용 부재 등의 여러가지 부재를 가공 정밀도가 높게 가공할 수 있다. This makes it possible to machine a variety of members such as optical members without using the organic solvent, high machining accuracy. 또, 본 발명의 바람직한 실시형태에 의하면, 상기 접착성 조성물의 경화체를 떼어낼 때, 경화체가 90℃ 이하의 온수와 접촉하여 팽윤하여, 필름상으로 부재로부터 회수할 수 있도록 함으로써 작업성이 뛰어나다고 하는 효과를 얻을 수 있다. In addition, according to a preferred embodiment of the invention, when removing the cured resin of the adhesive composition, and the cured product is excellent in workability by making it possible to recover by swelling in contact with warm water of at most 90 ℃, from a member in the form of a film the effect can be achieved that. 본 발명의 가고정 방법에 있어서는 본 발명의 상기 접착성 조성물로 이루어진 접착제를 이용하기 때문에, 전술의 효과를 확실히 얻을 수 있다. Since the use of an adhesive made of the adhesive composition of the invention In the temporary fixation method of the present invention, it is possible to surely achieve the effect described above. 본 발명의 가고정 방법에 있어서, 적당히 가열한 온수, 구체적으로는 90℃ 이하의 온수를 이용함으로써, 수중에서의 박리를 단시간에 달성할 수 있어 생산성이 향상한다. In the temporary fixation method of the present invention, a properly heated hot water, and specifically, the increase in productivity can be achieved the separation in water, the use of warm water of at most 90 ℃ in a short time. 상기 온수의 온도에 관해서는 30℃~90℃가 바람직하고, 40~90℃가 더욱 바람직하다. As for the temperature of the hot water is 30 ℃ ~ 90 ℃ preferred, and more preferably 40 ~ 90 ℃. 이러한 온수를 이용하면 단시간에 접착제의 경화물이 열팽창하는 것과 동시에, 조성물이 경화했을 때에 생기는 잔류 변형 응력이 해방된다. When using such a hot water at the same time as a cured product of the adhesive of thermal expansion in a short time, the residual strain stress is released occurs when the composition is cured. 또한, 상술의 입상 물질(D)를 함유하는 접착성 조성물을 이용하여 부재를 접착 가고정했을 경우, 상기 가고정된 부재를 가공 후, 상기 가공된 부재를 90℃ 이하의 온수에 침지하면, 상기 접착성 조성물의 경화체와 입상 물질의 선팽창 계수가 다른 것으로부터, 부재와 접착성 조성물의 경화체의 계면에 굽이치는 모양 내지 삼차원적 변형이 생겨 그 결과, 접착 면적의 감소를 달성되어 접착 강도가 저하하여, 필름상으로 접착제 경화체를 떼어낼 수 있으므로 바람직하다. In the case it decided to go bonding the members using an adhesive composition containing a particulate material (D) described above, if the go immersed after the forward member processing, the processed member in warm water of at most 90 ℃, the adhesive from which the coefficient of linear expansion of the cured product and the particulate material of the composition different, are blossomed the member and the adhesive surface undulating form to three-dimensional deformation of the cured body of the composition to achieve the result, the reduction of adhesion area and the adhesive strength decreases, film phase is preferred because it can remove the cured adhesive. 또, 경화체와 물의 접촉 방법에 대해서는 수중에 접합체마다 침지하는 방법이 간편하므로 추천된다. In addition, with respect to the cured product and the water contact method is recommended because it is convenient method of immersing in water for each conjugate. 본 발명에 있어서, 가고정할 때에 이용되는 부재의 재질에 특별히 제한은 없고, 자외선 경화형 접착제로서 이용하는 경우에는 자외선을 투과할 수 있는 재료로 이루어진 부재가 바람직하다. The method of the present invention, going used as, an ultraviolet-curing type adhesive is not particularly limited, the material of the member to be used when set, it is preferably a member made of a material capable of transmitting ultraviolet rays. 이와 같은 재질로서 예를 들면, 수정 부재, 유리 부재, 플라스틱 부재를 들 수 있다. As such a material, for example, there may be mentioned the modified members, glass members, plastic members. 따라서, 본 발명의 가고정 방법은 수정 진동자, 유리 렌즈, 플라스틱 렌즈, 또는 광 디스크의 가공에서의 가고정에 적용 가능하다. Accordingly, the temporary fixation method of the present invention to go at the crystal oscillators, glass lenses, plastic lenses, or an optical disk processing is applicable to the process. 본 발명의 가고정 방법에 있어서, 접착제의 사용 방법에 관해서는 접착제로서 광경화성 접착제를 이용하면, 예를 들면, 고정하는 한쪽의 부재 또는 지지 기판의 접착면에 접착제를 적당량 도포하고, 계속해서 다른 한쪽의 부재를 겹쳐 맞춘다고 하는 방법이나; In the temporary fixation method of the present invention, by using the the photo-curing adhesive as the adhesive it comes to how to use the adhesive, for example, an appropriate amount of adhesive to the bonding surface of the member or the support substrate to secure one side coating, and subsequently the other Align the overlap of one member and method of and; 미리 가고정할 부재를 다수 적층해 두어, 접착제를 틈새에 침투시켜 도포시키는 방법 등으로 접착제를 도포한 후에, 상기 부재를 가시광선 또는 자외선을 조사하고, 광경화성 접착제를 경화시켜 부재끼리 가고정하는 방법 등이 예시된다. Placing previously going multiple stacked set member, after applying the adhesive with such as a method of coating by infiltration of an adhesive in the gap, said member a, and irradiated with visible light or ultraviolet light, a method to cure the photo-curing adhesive to set to go between members such as this can be given. 그 후, 가고정된 부재를 원하는 형상으로 절단, 연삭, 연마, 구멍 뚫기 등의 가공을 한 후, 상기 부재를 물 바람직하게는 온수에 침지함으로써, 접착제의 경화물을 부재로부터 박리할 수 있다. Thereafter, go dipping a processing such as punching the desired cut in the shape, grinding, polishing, holes for the positive members after the member in water, preferably hot water, it is possible to peel the cured product of the adhesive from the member. 이하에 실시예 및 비교예를 들어 본 발명을 더욱 상세하게 설명하겠으나, 본 발명은 이들 실시예로 한정되는 것은 아니다. Hageteuna described in Examples and Comparative Examples in more detail the present invention are described below, but the invention is not limited to these examples. (평가방법) 유리 전이온도: 수지 조성물을 1 mm 두께의 실리콘 시트를 틀로 하여, PET 필름에 끼워, 무전극 방전 램프를 사용한 퓨전사제 경화 장치에 의해, 365 nm 파장의 누적광량 2000 mJ/cm 2 의 조건에서 윗면으로부터 경화시킨 후, 아래로부터 365 nm의 파장의 누적광량 2000 mJ/cm 2 의 조건에서 추가로 경화시켜 두께 1 mm의 수지 조성물의 경화체를 제작한다. (Evaluation method), glass transition temperature: by a silicone sheet of the resin composition is 1 mm thick framework, fitted on a PET film by the fusion Co. curing apparatus using an electrodeless discharge lamp, a wavelength of 365 nm cumulative quantity of light 2000 mJ / cm 2 after the curing from the top under the conditions, to cure further under the conditions of a cumulative quantity of light 2000 mJ / cm 2 with a wavelength of 365 nm from the bottom, to produce a cured product of the resin composition having a thickness of 1 mm. 제작한 경화체를 커터로 길이 50 mm, 폭 5 mm으로 절단하여 유리 전이온도 측정용 경화체로 하였다. By cutting the produced cured product as a length 50 mm with a cutter, a width of 5 mm was measured as the glass transition temperature for the cured product. 얻어진 경화체를 세이코전자산업사제, 동적점탄성 측정 장치 「DMS210」에 의해, 질소 분위기 중에서 상기 경화체에 1 Hz의 인장 방향의 응력 및 변형을 가하여 승온 속도 매분 2℃의 비율로 승온하면서 tanδ를 측정하고, 상기 tanδ의 피크 톱의 온도를 유리 전이온도로 하였다. By the obtained cured product are shown in Seiko Electronic Industry Co., a dynamic viscoelasticity measuring apparatus "DMS210", applying a stress or strain in the tensile direction of 1 Hz to the cured resin in a nitrogen atmosphere to measure the tanδ while raising the temperature at a rate of temperature increase rate per minute 2 ℃, the temperature of the peak top of the tanδ was the glass transition temperature. 인장 전단 접착 강도: JIS K 6850에 따라 측정했다. Tensile shear strength: measured according to JIS K 6850. 구체적으로는 피착재로서 내열 파이렉스(등록상표, 이하 같음) 유리(25 mm×25 mm×2.0 mm)를 이용했다. Specifically, it used the heat-resistant Pyrex (registered trademark, hereinafter the same) glass (25 mm × 25 mm × 2.0 mm) as the adhering member. 접착 부위를 직경 8 mm로 하여 제작한 수지 조성물에서, 2매의 내열 파이렉스 유리를 붙여 맞추고 무전극 방전 램프를 사용한 퓨전사제 경화 장치에 의해, 365 nm 파장의 누적광량 2000 mJ/cm 2 의 조건에서 경화시켜, 인장 전단 접착 강도 시험편을 제작했다. In the resin composition produced by the sealing region having a diameter of 8 mm, 2 sheets of heat-resistant Pyrex glass paste align free by the electrode Fusion Co. curing apparatus using the discharge lamp, 365 nm in terms of the cumulative quantity of light 2000 mJ / cm 2 with a wavelength of by curing, to prepare a tensile shear bond strength test specimen. 제작한 시험편은 만능 시험기를 사용하고, 온도 23℃, 습도 50%의 환경하, 인장 속도 10 mm/min로 인장 전단 접착 강도를 측정했다. The test specimens are produced using a universal testing machine, and the temperature 23 ℃, the humidity was measured tensile shear bond strength at 50% of the environment, and a tensile rate of 10 mm / min. 액 비중 : JIS Z8804(액체 비중 측정법-3, 비중 병에 의한 비중 측정 방법)에 따라 측정했다. Liquid specific gravity: measured according to JIS Z8804 (liquid weight measurement -3 and a specific gravity measuring method according to the specific gravity bottle). 박리 시험: 상기 내열 파이렉스 유리에 조성물을 도포하고, 지지체로서 청판 유리(150 mm×150 mm×두께 1.7 mm)에 붙여 맞춘 것 이외에는 상기와 같은 조건으 로 제작한 수지 조성물을 경화시켜, 박리 시험체를 제작했다. Peel Test: Except tailored applying the composition to the heat-resistant Pyrex glass, and attached as a support to cheongpan glass (150 mm × 150 mm × thickness 1.7 mm) by curing the resin composition produced by conditions lead as described above, the peeling test piece It was produced. 얻어진 시험체를, 온수(80℃)에 침지하여, 내열 파이렉스 유리가 박리하는 시간을 측정하고, 또 박리 상태도 관찰했다. The obtained test piece, by immersion in hot water (80 ℃), measuring the time when the peeling resistant Pyrex glass, and was also observed peeling state. 입상 물질(D)의 평균 입경 및 입경(㎛)을 대수로 표시했을 때의 입경에 대한 입자 부피 분포의 표준 편차: 레이저 회절식 입도 분포 측정 장치(시마즈제작소제 「SALD-2200」)에 의해 측정했다. Particulate material (D) average particle diameter and standard deviation of the particle volume distribution to the particle size when the particle size (㎛) have been shown as number of: laser diffraction particle size distribution analyzer (manufactured by Shimadzu Corporation "SALD-2200") as measured by did. 표 1, 표 2에 나타내는 종류의 원재료를 표 1, 표 2에 나타내는 조성으로 사용한 것 이외에는 실시예 1과 같게 하여 수지 조성물을 제작했다. Was used in the type of raw materials shown in Table 1, Table 2, the compositions shown in Table 1, Table 2, except that the same as in Example 1, to prepare a resin composition. 얻어진 조성물에 대해서, 실시예 1과 같이 유리 전이온도, 인장 전단 접착 강도, 액 비중의 측정 및 박리 시험을 실시했다. , And subjected to measurement of glass transition temperature and the peeling test, tensile shear bond strength, fluid density as in Example 1. For the obtained composition. 또, 입상 물질(D)의 평균 입경 및 입경(㎛)을 대수로 표시했을 때의 입경에 대한 입자 부피 분포의 표준 편차도 측정했다. In addition, it said standard deviation of the particle volume distribution to the particle diameter at the time the average particle size and particle size (㎛) of the granular material (D) have been represented by the number measurement. 그 결과를 표 1, 표 2에 나타낸다. The results are shown in Table 1, Table 2. 입상 물질(D)로서 평균 입자 지름 60 ㎛, 입경(㎛)을 대수로 표시했을 때의 입경에 대한 입자 부피 분포의 표준 편차 0.086, 비중 1.05의 구상 가교 폴리스티렌 입자(소켄화학사제 「SGP-150C」)를 사용하여, 표 3, 표 4에 나타내는 종류의 원재료를 표 3, 표 4에 나타내는 조성으로 사용한 것 이외에는 실시예 1과 같이 하여 수지 조성물을 제작했다. Particulate material (D) an average particle size of 60 ㎛, the standard deviation of the particle volume distribution for the grain size (㎛) in particle size when displayed on a logarithmic 0.086, specific gravity 1.05 spherical crosslinked polystyrene particles (soken Chemical Co. "SGP-150C" ) was used, and Table 3, was used in the type of raw materials shown in Table 4 with the composition shown in Table 3, Table 4, except the resin composition was produced in the same manner as in example 1. 얻어진 조성물에 대해서, 실시예 1과 같은 측정을 실시했다. For the obtained composition, and subjected to measurement as in Example 1. 그 결과를 표 3, 표 4에 나타낸다. The results are shown in Table 3, Table 4. 입상 물질(D)로서 평균 입자 지름 58 ㎛, 입경(㎛)을 대수로 표시했을 때의 입경에 대한 입자 부피 분포의 표준 편차 0.078, 비중 1.05의 구상 가교 폴리스티렌 입자(소켄화학사제 「SGP-150C」를 눈금 63 ㎛의 체와 눈금 53 ㎛의 체를 이용하여 체로 쳐서 제작)를 사용하고, 표 3에 나타내는 종류의 원재료를 표 3에 나타내는 조성으로 사용한 것 이외에는 실시예 1과 같이 하여 수지 조성물을 제작했다. Particulate material (D) an average particle size of 58 ㎛, the standard deviation of the particle volume distribution for the grain size (㎛) in particle size when displayed on a logarithmic 0.078, visualization of specific gravity 1.05 crosslinked polystyrene particles (soken Chemical Co. "SGP-150C" to produce a resin composition as in example 1 except that there was used a composition representative of the kind of the raw materials shown in the use of production) by hitting body by using a body of the scale 63 ㎛ of the body and the grid 53 ㎛ and Table 3 Table 3 did. 얻어진 조성물에 대해서, 실시예 1과 같은 측정을 실시했다. For the obtained composition, and subjected to measurement as in Example 1. 그 결과를 표 3에 나타낸다. The results are shown in Table 3. 입상 물질(D)로서 평균 입자 지름 140 ㎛, 입경(㎛)을 대수로 표시했을 때의 입경에 대한 입자 부피 분포의 표준 편차 0.074, 비중 1.14의 구상 가교 폴리메틸 메타크릴레이트 입자(간츠화성사제 「GM-5003」를 눈금 150 ㎛의 체와 125 ㎛의 체를 이용하여 체로 쳐서 제작)를 사용하고, 표 3에 나타내는 종류의 원재료를 표 3에 나타내는 조성으로 사용한 것 이외에는 실시예 1과 같이 하여 수지 조성물을 제작했다. Particulate material (D) an average particle size of 140 ㎛, particle size (㎛) the idea of ​​the standard deviation 0.074, specific gravity 1.14 in the particle volume distribution to the particle size when shown on a logarithmic cross-linked polymethyl methacrylate particles (Navegantes Kasei Kogyo Co., Ltd. " GM-5003 "in the same manner as in example 1 except that there was used a composition representative of the kind of the raw materials shown in the use of production) by hitting body by using a sieve with a 125 ㎛ body of the scale 150 ㎛ and Table 3. Table 3 resin the composition was produced. 얻어진 조성물에 대해서, 실시예 1과 같은 측정을 실시했다. For the obtained composition, and subjected to measurement as in Example 1. 그 결과를 표 3에 나타낸다. The results are shown in Table 3. 입상 물질(D)로서 평균 입자 지름 70 ㎛, 입경(㎛)을 대수로 표시했을 때의 입경에 대한 입자 부피 분포의 표준 편차 0.073, 비중 1.14의 구상 가교 폴리메틸 메타크릴레이트 입자(간츠화성사제 「GM-5003」를 눈금 75 ㎛의 체와 63 ㎛의 체를 이용하여 체로 쳐서 제작)를 사용하고, 표 3에 나타내는 종류의 원재료를 표 3에 나타내는 조성으로 사용한 것 이외에는 실시예 1과 같이 하여 수지 조성물을 제작했다. Particulate material (D) an average particle size of 70 ㎛, the standard deviation of the particle volume distribution to the particle size when displayed a particle size (㎛) in logarithmic 0.073, visualization of specific gravity 1.14 cross-linked polymethyl methacrylate particles (Navegantes Kasei Kogyo Co., Ltd. "as GM-5003 "in the same manner as in example 1 except that there was used a composition representative of the kind of the raw materials shown in the use of production) by hitting body by using a body of the scale 75 ㎛ sieve with 63 ㎛ of, and Table 3. Table 3 resin the composition was produced. 얻어진 조성물에 대해서, 실시예 1과 같은 측정을 실시했다. For the obtained composition, and subjected to measurement as in Example 1. 그 결과를 표 3에 나타낸다. The results are shown in Table 3. 입상 물질(D)로서 평균 입자 지름 40 ㎛, 입경(㎛)을 대수로 표시했을 때의 입경에 대한 입자 부피 분포의 표준 편차 0.071, 비중 1.14의 구상 가교 폴리메틸 메타크릴레이트 입자(간츠화성사제 「GM-5003」를 눈금 45 ㎛의 체와 38 ㎛의 체를 이용하여 체로 쳐서 제작)를 사용하여, 표 3에 나타내는 종류의 원재료를 표 3에 나타내는 조성으로 사용한 것 이외에는 실시예 1과 같이 하여 수지 조성물을 제작했다. Particulate material (D) an average particle size of 40 ㎛, the standard deviation of the particle volume distribution to the particle size when displayed a particle size (㎛) in logarithmic 0.071, visualization of specific gravity 1.14 cross-linked polymethyl methacrylate particles (Navegantes Kasei Kogyo Co., Ltd. "as GM-5003 "in the same manner as in example 1 except that there was used a composition representative of the kind of the raw materials shown in using the produced) by hitting body by using a sieve with a 38 ㎛ body of the scale 45 ㎛, Table 3. Table 3 resin the composition was produced. 얻어진 조성물에 대해서, 실시예 1과 같은 측정을 실시했다. For the obtained composition, and subjected to measurement as in Example 1. 그 결과를 표 3에 나타낸다. The results are shown in Table 3. 입상 물질(D)를 사용하지 않는 것 이외에는 실시예 1과 같이 하여 수지 조성물을 제작했다. Not to use the granular material (D) was prepared except that a resin composition as described in Example 1. 얻어진 수지 조성물에 대해서, 실시예 1과 같은 측정을 실시했다. The obtained resin composition, and subjected to measurement as in Example 1. 그 결과를 표 5에 나타낸다. The results are shown in Table 5. 실시예 2 및 5의 수지 조성물을 사용하여, 실시예 1과 같이 박리 시험체를 제작하고, 온수의 온도를 40℃, 50℃, 60, 70℃로 바꾸어 박리 시험을 실시했다. Example 2 and using the resin composition of 5, carried out to prepare a peel test sample as in Example 1, and subjected to a peeling test by changing the temperature of the hot water 40 ℃, 50 ℃, 60, 70 ℃. 그 결과를 표 6에 나타낸다. The results are shown in Table 6. 그 결과, 어느 온도에서도 박리성을 갖는다. As a result, it has a peeling resistance at any temperature. 실시예 2의 수지 조성물을 이용하고, 세로 150 mm×가로 150 mm×두께 2 mm의 판상 내열 파이렉스 유리와 실시예 1에서 이용한 청판 유리[더미 유리(dummy glass)로서 사용]를 실시예 1과 같이 접착 경화시켰다. Example 2 using the resin composition of and Use as a dummy glass (dummy glass)] cheongpan glass used in a vertical 150 mm × width 150 mm × plate-like heat-resistant Pyrex glass having a thickness of 2 mm as in Example 1, the same manner as in Example 1 adhesive was cured. 상기 접착 시험체의 내열 파이렉스 유리 부분만을 다이싱 장치를 사용하여 10 mm 사각형으로 절단했다. Only the heat-resistant Pyrex glass portion of the adhesive test piece by means of a dicing device was cut into a 10 mm square. 절단 중에 내열 파이렉스 유리의 탈락은 발생하지 않고, 양호한 가공성을 나타냈다. Dropping of the heat resistant Pyrex glass occurred during cutting is not limited and to exhibit a good processability. 내열 파이렉스 유리 부분만을 절단한 접착 시험체를 80℃의 온수에 침지했는데, 60분에 모두 박리했다. Was immersed in the adhesive test piece cutting only the heat resistant Pyrex glass portion of the hot water 80 ℃, it was peeled off both after 60 minutes. 또, 그 박리한 절단 시험편을 무작위로 10개 꺼내, 그 절단 시험편의 이면(수지 조성물로 가고정한 면)의 각 편을 광학 현미경을 이용하여 관찰하고, 유리가 빠져 있는 개소(chipped portion)의 최대폭을 측정하여, 그 평균값으로 표준 편차를 구했다. Further, the maximum width of the out of ten randomly its separation by cutting test pieces, and the back surface of the cut test piece portion (chipped portion) that observed under a light microscope for each piece, and out of the glass (side set to go to the resin composition) the measurements was determined by the standard deviation of the mean value. 그 결과를 표 7에 나타낸다. The results are shown in Table 7. 핫멜트형 접착제(일화정공사제 「아드픽스 A」)를 90℃로 가열하여 용해시키고, 150 mm×150 mm×2 mm의 내열 파이렉스 유리와 실시예 1에서 이용한 청판 유리를 접착시켰다. Hot melt adhesive (manufactured by episodic positive hole "ad suffix A") was heated to 90 ℃ dissolved and, bonding the cheongpan glass used in the heat-resistant Pyrex glass as in Example 1 of 150 mm × 150 mm × 2 mm. 상기 접착 시험체의 내열 파이렉스 유리 부분만을 다이싱 장치를 사용하여 10 mm 사각형으로 절단했다. Only the heat-resistant Pyrex glass portion of the adhesive test piece by means of a dicing device was cut into a 10 mm square. 절단 중에 내열 파이렉스 유리의 탈락은 발생하지 않고, 양호한 가공성을 나타냈다. Dropping of the heat resistant Pyrex glass occurred during cutting is not limited and to exhibit a good processability. 그 시험편을 N-메틸피롤리돈 용액에 1일 침지하고, 절단 시험편을 회수하여, 실시예 26과 같이 박리한 절단 시험편을 임의로 10개 꺼내, 그 절단 시험편의 이면(핫멜트형 접착제로 가고정한 면)의 각 편을 광학 현미경을 이용하여 관찰하고, 유리가 빠져 있는 개소의 최대폭을 측정하여, 그 평균값으로 표준 편차를 구했다. Immersing the test piece in one day N- methylpyrrolidone solution, followed by recovering the cut test pieces of Example 26 and one out of ten randomly cut peeling test pieces described above, the back surface of the cut test piece (set to go to the hot melt adhesive surface ) observed under a light microscope for each side of, and by measuring the maximum width of the portion located in the glass was obtained from a standard deviation by the average value. 그 결과를 표 6에 나타낸다. The results are shown in Table 6. UV 경화형 PET 점착 테이프를 사용하여 150 mm×150 mm×2 mm의 내열 파이렉스 유리를 접착시켰다. UV-curable PET adhesive tape was bonded using a heat-resistant Pyrex glass of 150 mm × 150 mm × 2 mm. 상기 접착 시험체의 내열 파이렉스 유리 부분만을 다이싱 장치를 사용하여 10 mm 사각형으로 절단했다. Only the heat-resistant Pyrex glass portion of the adhesive test piece by means of a dicing device was cut into a 10 mm square. 그 시험편의 점착 테이프 부분에 자외선을 조사시킴으로써 점착력을 저하시켜, 그 절단 시험편을 회수했다. By an adhesive tape portion of the test piece lowering the adhesive strength by irradiation of ultraviolet rays, and recovering the cut test piece. 그 절단 시험편을 실시예 26과 같이 박리한 절단 시험편을 임의로 10개 꺼내, 그 절단 시험편의 이면(점착 테이프로 가고정한 면)의 각 편을 광학 현미경을 이용하여 관찰하고, 유리가 빠져 있는 개소의 최대폭을 측정하여, 그 평균값으로 표준 편차를 구했다. The cut test piece Example 26 and was taken out arbitrarily to 10 for cutting the test piece peeled off as shown, the rear surface of the cut test piece observed under a light microscope for each piece of (if determined to go to the pressure-sensitive adhesive tape), and the portions of missing glass by measuring the maximum width was obtained as the mean value standard deviation. 그 결과를 표 6에 나타낸다. The results are shown in Table 6. 표 6에 의해, 본 발명의 가고정 방법은 부품 가공시 치핑 발생 방지의 점에서 특별히 뛰어난 것이 나타난다. By Table 6, of the present invention to go forward method it is shown that particularly excellent from the viewpoint of chipping prevention when machining parts. 본 발명의 접착성 조성물은 그 조성 때문에 광경화성을 가져, 가시광 또는 자외선에 의해서 경화하며, 그 경화체는 절삭수 등에 영향을 받지 않고, 높은 접착 강도를 발현할 수 있으므로 부재의 가공시에 어긋남을 일으키기 어렵고, 치수 정밀도 면에서 뛰어난 부재를 용이하게 얻을 수 있다고 하는 효과를 얻을 수 있다. Get the photocurable Since the adhesive composition of the present invention the composition, and cured by visible light or ultraviolet light, the cured product without being affected by cutting water, it can exhibit a high adhesive strength to cause displacement during processing of member it is difficult, it is possible to obtain the effect that can be obtained to facilitate the member excellent in terms of dimensional accuracy. 또한, 온수에 접촉함으로써 접착 강도를 저하시켜, 부재간의 혹은 부재와 지그의 접합 강도가 저하하므로 용이하게 부재를 회수할 수 있다. In addition, by reducing the adhesive strength through contact with warm water, can be easily recovered so that the member or members and the bonding strength of the jig between the member decreases. 그 때문에, 광학 렌즈, 프리즘, 어레이, 실리콘 웨이퍼, 반도체 실장 부품 등의 가고정용 접착제로서 산업상 유용하다. Therefore, to go, such as optical lenses, prisms, arrays, silicon wafers, semiconductor packaging parts is industrially useful as a household adhesive. 본 발명의 부재의 가고정 방법은 상기 특징을 갖는 접착성 조성물을 이용하고 있으므로 종래 기술에 있어서 필요했었던 유기용매를 이용할 필요가 없고, 또 필름상으로 부재로부터 회수할 수 있으므로 작업성이 뛰어나다고 하는 특징이 있으므로 산업상 매우 유용하다. Going to the member of the present invention defined way, so we used the adhesive composition having the above features there is no need to use an organic solvent which had required in the prior art, and can be recovered in the form of a film from the member and workability is excellent since this feature is very useful in the industry. 또한, 2006년 8월 10일에 출원된 일본 특허 출원 제2006-218416호의 명세서, 특허 청구의 범위 및 요약서의 전체 내용을 여기에 인용하여, 본 발명의 명세서의 개시로서 도입하는 것이다. Further, by reference the entire contents of the range and the abstract of the Japanese patent application specification, claims the arc 2006-218416 filed on August 10, 2006, herein, is to introduce as disclosed in the specification of the present invention. (A) 다관능 (메타)아크릴레이트, (B) 단관능 (메타)아크릴레이트, (C) 광중합 개시제, 및 가교 폴리메타크릴산 메틸 입자, 가교 폴리스티렌 입자 및 가교 폴리메타크릴산 메틸 폴리스티렌 공중합체 입자 중 어느 하나 혹은 그 일부 또는 전부의 혼합물인 (D) 입상 물질을 함유하는 접착성 조성물로서, 상기 접착성 조성물로부터 얻어지는 경화체의 유리 전이온도가 -50℃~40℃인 접착성 조성물을 이용하여 부재를 접착하고 가고정하여, 상기 가고정된 부재를 가공 후, 상기 가공된 부재를 90℃ 이하의 온수에 침지하여, 상기 접착성 조성물의 경화체를 부재로부터 떼어내는 것을 특징으로 하는 부재의 가고정 방법에 대한 용도에 사용하는 접착성 조성물. (A) a polyfunctional (meth) acrylate, (B) a monofunctional (meth) acrylate, (C) a photopolymerization initiator, and cross-linked polymethyl methacrylate particles, crosslinked polystyrene particles and crosslinked polymethyl methacrylate polystyrene copolymer an adhesive composition containing a mixture of (D) the particulate material of any one of the particles or a part or all, by using the cured adhesive composition having a glass transition temperature of -50 ℃ ~ 40 ℃ of obtained from the adhesive composition appointed to go to bond the members, temporary fixation method of the member, characterized in that the go after the positive element processing, and immersing the processed member in warm water of at most 90 ℃, detaching the cured resin of the adhesive composition from the member the adhesive composition used for the purposes of the. (A) 및 (B)가 모두 소수성인 접착성 조성물. (A) and (B) are both hydrophobic adhesive composition. (A) 및 (B)를 (A):(B)=5:95~95:5(중량부)의 비율로 함유하고, (A) 및 (B)의 합계 100 중량부에 대해서, (C)를 0.1~20 중량부 함유하는 접착성 조성물. The (A) and (B) (A) :( B) = 5: 95 ~ 95: 5 (containing a ratio of parts by weight), with respect to the total 100 parts by weight of (A) and (B), (C ) from 0.1 to 20 parts by weight containing adhesive composition. (D)를 (A) 및 (B)의 합계 100 중량부에 대해서, 0.1~20 중량부 함유하는 접착성 조성물. (D) for (A) and (B) in total, based on 100 parts by weight of the adhesive composition containing from 0.1 to 20 parts by weight of. (D)의 비중이 상기 접착성 조성물의 비중과 동일하거나 혹은 작은 접착성 조성물. The specific gravity of (D) the specific gravity of the adhesive composition and the same or smaller adhesive composition. (D)의 형상이 구상인 접착성 조성물. The adhesive composition is the image of (D) spherical. 레이저법에 따른 (D)의 평균 입경이 20~200 ㎛인 접착성 조성물. An adhesive composition the average particle diameter of the (D) according to the laser method is 20 ~ 200 ㎛. 레이저법에 따른 (D)의 입경(㎛)을 대수로 표시했을 때의 입경에 대한 입자 부피 분포의 표준 편차가 0.0001~0.25의 범위에 있는 접착성 조성물. The adhesive composition in the range of the standard deviation of the particle volume distribution to the particle diameter of 0.0001 ~ 0.25 when the particle size of the display (㎛) of (D) according to a laser method to algebra. 청구항 1 내지 청구항 6, 청구항 8 및 청구항 9 중 어느 한 항에 기재된 접착성 조성물을 이용하여 부재를 접착하고 고정하여 이루어지는 구조체. It claims 1 to 6, claim 8 and claim 9 of the adhesive composition structure obtained by bonding and fixing the member by using the described in one. 청구항 1 내지 청구항 6, 청구항 8 및 청구항 9 중 어느 한 항에 기재된 접착성 조성물을 이용하여 부재를 접착하고 가고정하여, 상기 가고정된 부재를 가공 후, 상기 가공된 부재를 90℃ 이하의 온수에 침지하여, 상기 접착성 조성물의 경화체를 부재로부터 떼어내는 것을 특징으로 하는 부재의 가고정 방법. Claims 1 to 6, claim 8 and claim 9 by using the adhesive composition according to any one appointed to go and adhering the member of the go after the forward member processing, the processed member in warm water of at most 90 ℃ by immersion, temporary fixation method of the member, characterized in that detaching the cured resin of the adhesive composition from the member. JP5909460B2 (en) * 2012-09-28 2016-04-26 富士フイルム株式会社 Temporary adhesive for semiconductor device manufacturing, as well as, adhesive support using the same, and method for manufacturing a semiconductor device. JP4874011B2 (en) 2012-02-08 Adhesives, adhesive sheet using the pressure-sensitive adhesive, multi-layered adhesive sheet using an adhesive sheet, and a manufacturing method of an electronic component using the multi-layered adhesive sheet.